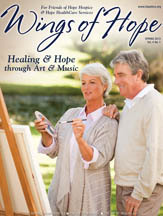 Art and music therapy are the focus of the most recent issue of the Wings of Hope newsletter. "Music has always been instrumental to my happiness, and playing is certainly much better than lying in bed and suffering. Thanks to Hope's Music Therapy program, I now look forward to each day with interest."